Some of you will know that I began going to a chiropractor last fall. We think it was the result of a fall last June, but for some reason I didn't feel it until later. By the end of October I was unable to turn to the right without significant pain. I had to do something. Now it had been a while since I had been under chiropractic care. I went for a long time when my work put me on the road more and I had developed chronic lower back pain. When I stopped driving so much though the pain went away and so I never bothered to find a chiropractor in my new location. No doubt this is why it seemed like it was all 'new' to me. For it was. My old chiropractor would adjust me every couple of weeks and I would leave with a great sense of relief. My new chiropractor's treatment is much more involved. It includes an adjustment --- although usually not like I remember it. It now involves this hammering tool which can somehow measure where things are out of whack and what part of my back needs special attention. After that I was spending up to forty minutes in traction. And then we always ended with 'ice and stim.' For a while there I was going three times a week for this. Now while most of my appointment involved things which were not exactly painful, it also wasn't all that pleasant. I have to say, though, that I really came to dread the 'ice and stim' at the end. I would lie there on my stomach and in the heart of winter they would pile ice packs on my back. Next they would attach these little round electrodes to my shoulders and my lower back. And then they would slowly turn up the electricity, waiting for me to tell them when to stop. Well, evidently, early on I had come away with a complete misunderstanding of what the 'ice and stim' was for. Somehow I thought that the more it hurt, the more good it was doing. And so since I could endure it all the way up to 'fifty,' which was the maximum, I did not tell them to stop. No, it did not seem quite right that I found myself practically walking out to my car sideways afterward, but I thought that was just how it was. Then one day I found myself lying next to an old acquaintance. As young Andrew, the chiropractic assistant, announced once more that I was at 'the max,' the person lying next to me marveled and said, "Wow. I can only take a nine or a ten." It hit me then that perhaps I was enduring this suffering for no good purpose. The next time I came in I quietly asked Chris, the other assistant, if it was doing any good for me to take the 'stim' to the max. And she laughed out loud. "No!" she exclaimed. "This is supposed to be pleasant --- a kind of reward after all your hard work!" Apparently, the two assistants had been huddling together for weeks, shaking their heads at my seemingly wanting to have such electric shock coursing through me! I found myself reflecting on my recent experience of purely senseless pain as I did some reading this week on what it was that actually killed Jesus. (It's not hard to find, but you can click here for the original 1986 article.) It goes without saying, of course, that his was not a painless death. No, indeed, those who know more about how the human body functions than I do will tell you that the pain must have been tremendous even before he hung on that cross. Indeed, Jesus' suffering began long before the spikes were driven in and his cross hoisted high. And of course we know that this was not only physical suffering... imagine again the scourging coupled with the pain of being betrayed, abandoned, denied, interrogated, and intentionally humiliated. And imagine all of this with no sleep. Again, those who know more about this insist that probably by the time Jesus was actually hung on the cross, his condition was critical. It is likely that he was already in a state of shock. Then once on the cross, his body would have been hanging in such a way that there was no possible way for him to breathe deeply without shifting his body weight. To be sure, with those spikes driven through his wrists, the pain had to have been simply excruciating. You and I who have memorized the details of Jesus' dying in our behalf --- we have come to believe that this is pain with purpose. And it is. At the same time, however, it was also utterly senseless suffering. It was gratuitous torture of the worst kind. It was done at the request of a mob, ordered by a ruler who literally washed his hands of it, and with mostly strangers to witness it. It was humiliating in the extreme --- literally stripping the one executed of all his dignity. It was the kind of pain which had Jesus crying out his anguish at having been abandoned by the One whom he called Father. It did not have to be and it simply should not have been. I'm sorry, but nothing will convince me otherwise. Even so, the fact is that it was. It did happen as it surely does still happen so many times in so many parts of the world every day. And while it was 'senseless,' it was not finally without purpose for in it and through it Jesus died with all those who suffer senselessly still. And somehow by the power of God even its utter senselessness is somehow brought meaning. For even while we stand within the depravity of the happenings of that Friday? We know that these do not get to have the last word. Something more stands on the other side of all of this. God does bring life through it and out of it and if God can do that? The promise holds that even still, even now God can and God does bring newness and life and joy out of places where we might be tempted to believe that God is utterly absent. As for the rest, I'm still working it out. There is more mystery here than I can comprehend or begin to explain. It may well take the rest of my Holy Weeks and difficult days and nights and then some to plumb its meaning. For now, I suppose, I am left with this. There is nowhere Jesus would not, did not go in our behalf. And his going there and all that came after makes real the possibility that God can do things with what first seems utterly senseless in ways I can only begin to imagine. Not that they ever should happen. And it's not that you and I should not do all we can to prevent it from happening. Even so, it does still happen. And so surely it is it is also so that whenever I suffer, whenever we suffer, too, especially in behalf of others? We can be certain Jesus is there as well. How do you begin to make sense of the senselessness of Jesus' Suffering on the Cross? On Good Friday we turn to John's rendering of this familiar story. Matthew, Mark and Luke offer their versions as well. Is there one in particular where you have found a 'home?' Why is that? I find myself not a little surprised this week that after all these years I am struggling with the meaning of the atonement. For some reason the old 'pat lines' just don't seem to ring as true as they once did. And so I'm trying to go deeper. Into the story itself, yes, but I have also picked up a book which is helping me think it through: Transforming Atonement: A Political Theology of the Cross, by Theodore W. Jennings, Jr. If you have already 'worked this out,' what helped you to do so? Where would you send someone to try to understand the meaning of the cross? I waited in line for nearly an hour last Saturday afternoon. It was 'Community Shred Day' at our local credit union, you see, and I had shredding to do. My mother retired from teaching third grade twenty-one years ago this spring. 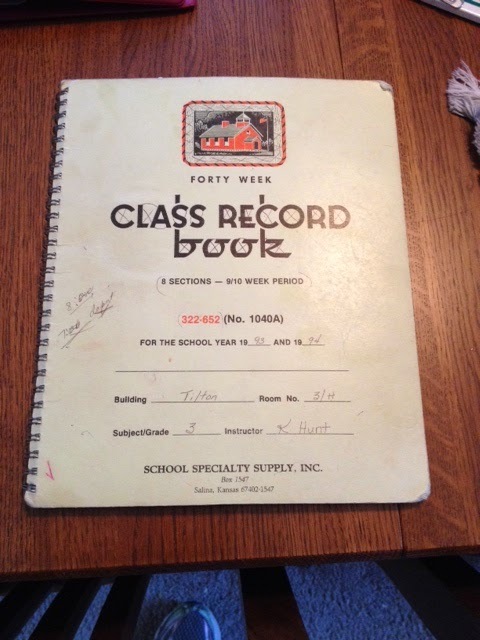 All these years she has kept the grade-books from her last ten years in the classroom. For many of those years they were neatly lined upon the bottom shelf of the bookcase in her home office. When asked why she kept them, she said she wanted to be able remember the children. it was finally time to dispose of them. As for me, I wouldn't have thought twice about tossing them into the recycling bin. It has been such a long time, after all. "But, no," she insisted. "Those grades are confidential." And so for the last six months they have sat next to our home shredder, waiting to be destroyed. Only it was not a small job and it didn't get done and it didn't get done. When I heard I could easily drop them off and someone else would shred them for us, I suggested that was the day. And so she sat in her recliner and carefully pulled out the class lists --- holding on to the names of children who by now may well have third graders of their own --- and letting me tear out all the rest of the pages into a box and into the back of my car. And by now, these several days later, those probably long forgotten grades are obliterated -- gone to join bank records and old tax forms and who knows what else in a semi-truck load full of confetti sized pieces of paper. All that is left are the names of hundreds of children which a long retired elementary school teacher can't quite bear to get rid of. Now to be sure, this is certainly not an adequate comparison for the way in which Jesus deals with you and me. Even so, in this Gospel for Maundy Thursday, we hear about Jesus kneeling at the feet of the disciples, serving them. We hear about him washing their feet. And yes, we hear him say that this washing is necessary and now they are clean. Their Teacher and Friend, Master and Lord washes them clean. By Jesus' action, all is forgiven and forgotten except for his profound love for them. And yes, on this day Jesus extends to them and to all of us a New Commandment calling us to love one another in the same way he has loved us. And so yes, isn't this a little like an old third grade teacher -- still loving those children enough after all these years to guard their privacy --- and still holding them close enough to heart to seek to remember them even now? Not by how well they did or did not do --- but by the simple certainty that they were and they are and they once sat in her classroom? Isn't that a little like how Jesus loved us and loves us still? Judging us not by what we have done or not done, but always only with a heart of love? I can't help but wonder what that would look like if we, indeed, were to live and love in that way, too. As Jesus calls us to now. There are lots of ways to imagine what the forgiveness of sins can 'look like.' Being washed clean is the one that is presented in this familiar Gospel story. Does 'shredding' also work? Why or why not? What other image might you use? For the most part, I rather like the idea that any record of what I 'have done or not done' will one day be destroyed and all that will be left is Jesus' love for me. I do say this somewhat guardedly, for I suppose there are parts of what I have done that I feel some pride in...At the same time, I am deeply aware that whatever I do will never be enough. In the end, wouldn't we rather be judged only by love? I came down with a cold two days after Ash Wednesday this year. I confess to feeling a little smug that it had not taken me down earlier. Well, maybe not exactly smug --- but certainly grateful and surprised. Everyone around me had fallen to the nasty germ and somehow I had escaped. And then I didn't. It ran its course and I had a halfway decent week. And then it came back. And for the last week I have hardly slept with the congestion and coughing spasms. A visit to the doctor told me I'm not contagious though --- for it is just a cold. So in this busy season I've just kept on working. However, it has been impossible to keep this barking cough a secret. Indeed, kind people around me are leaving me their favorite cough drops or lozenges. I've tried them all. And I find I am inundated with chicken soup! And lots of advice. Oh yes, all kinds of good advice on how to get past this. My doctor told me to call back if it got worse. Two nights ago I coughed until I could not breathe. Surely this was 'worse' enough and so I finally called back. And as of this writing I am finding myself extremely grateful for an inhaler and am glad to say I slept a little more last night than I have in days, aided by a powerful cough syrup which promised to take away all my pain. I am a wimp, I know. Compared to many, I know so little of suffering and yet I've gotten enough of a taste in the last three weeks to wonder how I will do when I really come up against it. Even with this relatively brief, although surely nasty illness, I have started to forget what it feels like to not cough every time I breathe, or speak, or open my mouth to eat or drink. Indeed, even with a felt, urgent need to cough, I grew so tired, I could hardly croak. (But I croaked a lot.) And while I have tried to find something redemptive in even this small suffering? I'm not coming up with much of anything. I just want to be done with it. I want my old life back where I'm not reliant on a stash of cough drops and where sleep is uninterrupted by my body's desire to expel what has taken it over! And so here it is. Again this week we have before us images of dying and rising. Indeed, we have before us now this marvelous image of a grain of wheat whose entire reason for being is to die so that something more might come of it. And we have before us this certain truth, bearing down us more surely now than ever before in this season, that Jesus did suffer and die for us. And there is this completely impossible to comprehend expectation that our lives as we know them and cherish them are finally, not to be ultimately loved. And that dying with a greater purpose is somehow also meant to be ours. For oh, in these last weeks, how I have been reminded of my humanness. Of how frail the human body truly is. And yes, I do forget this sometimes. Or at least I fail to think of it when all my systems are working at full strength. To be sure, even an unrelenting cough can be a reminder of one's mortality. To be human is to have limits. Even in busy Lent. Our reading from John today points to this certain truth. Jesus came to us as one so very human that eventually the demands on his body became too much. On the cross, his lungs did not finally hold up. (Indeed, as I understand it, those who have studied how crucifixion actually works tell us that it is usually actually death by suffocation. Hanging there, the body folds over on itself until the airflow is cut off. Whether that was the case with Jesus we do not know. We do know, however, that his breathing stopped.) We do not hear that Jesus ever suffered a late winter's cold which would not let go. However, made like you and me, he surely could have. I finally had to ask for help. I gave up on completing list of phone calls which had to be made before Sunday because I knew I simply could not make them. I had neither the voice nor the breath. I asked for help. And the one who willingly added this to her already busy week told me she was blessed in doing so. My small 'dying' enabled another to live. And this week in worship, I gave over more of the leadership to an assisting minister. And when I sat with the children to teach them the familiar John 3:16, I literally had to urge them to speak up, for I could not. Perhaps my small 'dying' (not unlike a grain of wheat falling into the ground) enables others to speak and so to live. Imagine that. I coughed through an entire three hour council meeting on Tuesday night. I could visibly see the cringes of those around the table. I did not extend my hands to hold those of others when we closed with the Lord's Prayer as we always do. They were grateful, I know. And then the chicken soup and cough drops started coming. We've all been there, of course --- so in need of one another. Even with just a cough. My very visible and audible struggle allowed others to extend kindness. Yes, perhaps my small 'dying' enabled others to live. Imagine that. As for the grain of wheat that dies --- it's whole purpose is to die and multiply. Not just taken down by a late winter's cold, this one, but actually being born in order to die for the sake of a more abundant life. I don't know if a seed 'suffers' in the dark beneath the earth. I don't know if the grain of wheat 'hurts' or 'cries out in pain' when it feeds on itself in order to give its growth its first sustenance. I am not a grain of wheat. Like you, I am a human being. As we hear again the story we know so well, we understand that the very human Jesus had one purpose, too. He came for the life of the world -- a purpose which would lead to --- even require his dying. And we do know he suffered so. Because we are also human, perhaps we have some small sense of what that must have been. I don't believe God wills even the small suffering I have endured in these last weeks. And yet, even now I have seen God use this 'dying' in small ways to deepen life for me and those I walk alongside. I find myself gifted with a perspective I've never had before or have somehow forgotten --- about what matters most and all that I am called to give thanks for. I have gotten a taste of what it is to be less than self-sufficient and more deeply reliant on the gifts of others of God's people. I have received a sure experience of the truth that a whole lot --- even everything --- can go on just fine without me. Even a moment of not breathing is a sure reminder that one day this will be so. No, I can't imagine that God really wants us to 'hate life.' At the same time, there are parts of life and ways of living which are less than God intends for us. And most of us, if we are so fortunate, can think of something worth dying for. And so now, even in this small 'dying' of a late winter's cold whose grip has not quite let me go, I am left with the question of what the rest of my living might be for. Indeed, wouldn't it be something if in my living and in my dying --- which one day I shall surely do --- like a grain of wheat, my life given over should bear much fruit? Not as Jesus did, of course --- but as Jesus' follower --- surely in some small way as well? The words of Jesus now surely have us grappling with the question of what our living and dying is for. How would you answer that question? Have you ever grappled with illness --- serious, or like mine, not so serious? What kind of perspective does that give you on the "grain of wheat that falls into the earth and dies?" In those times, have there been ways in which your 'dying' allowed others to live? What do you make of Jesus' words that we are to hate our lives in order to keep them? How do you understand this hard truth? How does your understanding of this change how you live? I find myself remembering Lyle this week-end. Lyle was a member of my first congregation. He was number seven or eight in a line of children --- all then in their late 60's or 70's, all still living, and for the most part, all still living within reach of one another. He was a retired farmer. He was an avid fan of his grandchildren's high school sports --- so much so that after he died, they named a trophy after him. I remember him now as quite affable. I also remember that he was a little stubborn. Well, this meant, of course, that from spring until fall, Lyle would have to think harder about 'the time' to be sure he didn't miss worship, or an appointment, or a ballgame. The sacrifice must have been worth it for him, though, for his whole life he had been governed by the rise and the fall of the sun. The actual time on the clock made no difference to him. If the sun was up it was time to go to work. If it was not, he was done with his day. Although Lyle was out of step with the rest of us, he was right, of course. What difference does it really make to take an hour of sunshine and remove it from the beginning of the day, only to tack it on at the end? It is not as though daylight itself is actually being 'saved' then. We still have the same number of hours of light in our day. No, indeed, not a one of us can 'control' the light --- all we can do is position ourselves in relationship to the light. Which is why, of course, until now I have not been able to grow a garden in my back yard. The 100 year old ash tree which had to be taken down last summer was casting too much shade for the light to get to my tomato plants. (Believe me, I tried.) In this case, given where my lot lines fall and the proximity of that tree, it was simply not possible to plant where there would be ample sunshine. So I quit trying. Which is why, of course, during these long winter months it has mattered where I park my car in the driveway. If I am too close to the garage, inevitably, I have had to allow extra time to scrape the frost from the windshield. If' I am parked a little further back, the sun has a chance of doing it for me. 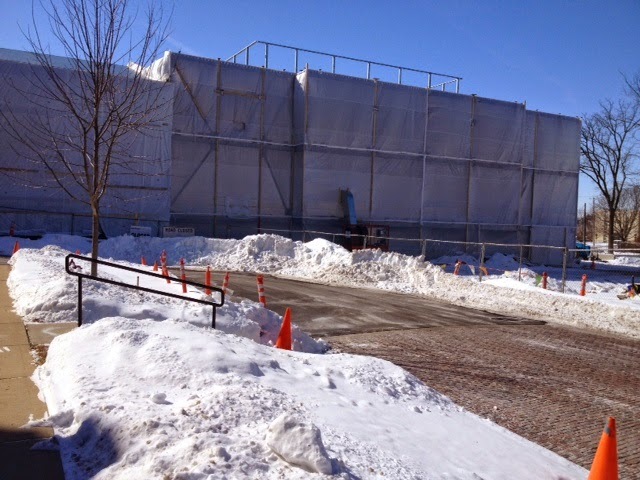 Which is why, I suppose, they have chosen to completely encase the massive building project going on near our church in plastic --- and they are piping in heat so as to approximate milder temperatures which are more conducive for pouring cement. If you look closely, you can see one of the blowers pictured above. (Can you even begin to imagine what this is costing -- particularly in the especially frigid February we have just gone through here in northern Illinois?) Indeed, I suppose in this case they are 'controlling the light' --- or at least its byproduct --- but at what expense? I can't help but wonder what even soft spoken Lyle would have had to say about this! In our Gospel lesson today we hear a whole lot about light and darkness. Just like we can't control how long the sun will shine in the sky, we also cannot control the light John points to here. All we are called to do is stand in the light which has come into the world--- this light that is Jesus. Of course, the words before us now remind us that sometimes we do prefer the darkness --- particularly if we feel we have something to hide. Indeed, I think now of a while back when we experienced some minor vandalism --- some graffiti was discovered on a back door of the church early on a Saturday morning. Once it was reported and cleaned up, it was left to us to decide how to prevent it in the future. Our solution was to turn on the alley light so that there are no dark corners. It has not happened again. Or I think of the family --- or the congregational family --- which has harbored 'secrets' --- parts of their experience which have been kept hidden from most of the rest of the 'family.' It is only when those 'secrets' are exposed to the light, that there is any chance of healing. Some of you will know of what I speak when I say that in those cases, sometimes we have to be dragged kicking and screaming into the light. And yes, sometimes it is so that we have to 'live in the light' for a while before we start to realize and experience the gifts of accountability or forgiveness or new beginnings. And yet, while we might like to believe otherwise, it goes without saying that each and every one of us has something we prefer not be exposed to the light. There are parts and pieces of ourselves, our experiences, our histories, our foibles, we would not want to risk to the harsh light of the scrutiny of others. What is important to remember though is that while the light that is Jesus exposes what is wrong in and among us? It is also the light that shines out God's unending grace which is ours to receive in its entirety in John 3:16 --- also a part of this week's reading from John. This is the light that came to save and not to condemn. This is the light that brings healing in its forgiveness. This is light that brings life. This is the Light that is Life itself. And it can't do what it does --- Jesus can't do what Jesus promises to do --- without our being 'exposed' as completely human and entirely in need of that Light of Grace and Forgiveness. So yes, Lyle was mostly right. We can't control the light. It simply comes as Jesus did and does --- and in the case of Jesus, by God's will and God's doing. But maybe Lyle was also a little wrong --- at least as we understand Daylight Saving Time to be our very human effort to position ourselves in relationship to the light for a little longer in a world which is far less agrarian than it used to be. For in the same way, we can still choose whether to stand in the Light that is Jesus or not. When it comes to Daylight Saving Time, I imagine that debate will continue. Either way, Lyle's argument with the rest of us has me thinking this week about light and how I stand in relationship to it. Especially this Light that is Jesus. How about you? I find it hard to preach on very familiar texts like John 3:16, so as you can see I have chosen to focus on the verses which follow. How about you? What might you say about John 3:16? Does the way in which I have tied them together make sense? Can you think of other examples where light has brought healing or protection or hope? How is light a gift? What does it mean for you to 'stand in the light?' How has that brought life to you? know the one I'm talking about: that one which is making its rounds on the internet these days and has captured the imagination of early morning news hosts. That dress which is clearly white and gold. At least to my eyes. Indeed, we find ourselves in a state of consternation when we discover that our friends and family members and co-workers see different colors altogether. At least I know I find myself more than a little puzzled by it: how two of us can look at the same image and see something entirely different. As the experts have tried to understand and explain this phenomenon so that the average person can understand it, one even offered that actually 'color' doesn't exist. It is all in our minds. We simply see what we see. While I am not at all convinced of the truth of that explanation, it is hard to understand, isn't it? Especially when 'color' has always seemed so obvious. Now I am not color blind. At the same time, I am not color confident, if you know what I mean. I prefer to wear dark colors and to paint my walls in neutral tones of beige or white. It is only with the strong encouragement of others that I have stepped out of my comfort zones in either place. Even so, I will probably always be most comfortable with neutral tones which have no chance of clashing or offending. Bright, bold colors always do feel a little risky to me. 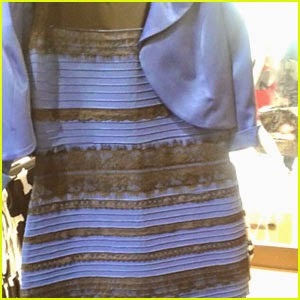 I don't know --- perhaps that is why I 'see' white and gold when I look at 'the dress.' And yes, I can't help but wonder if that is also sometimes true in the rest of my life. One could argue whether Jesus is seeing bright bold 'red' or whether his comprehension of what is before him is simple 'black and white' when he enters the temple in John's telling today. Either way, he is surely 'seeing' something which others no longer see or have never been able to see or for the sake of protecting the powerful or not 'rocking the boat' have simply chosen not to see. One wonders how it is that Jesus 'saw' what no one else could or would. How could his perception have been so radically different that he would act with such forthright certainty to make right that which was so wrong. And yet, we do recall that the temple held precious memories for Jesus. It was the destination where every Jewish child knew he or she would make at least one pilgrimage in their lifetimes. It was the place where he had gotten so caught up in conversation with the teachers when he was a small child himself, that his parents lost track of him. To be sure, unlike any who had come before, this was his home before any other home for he understood it to be his 'Father's house.' So perhaps it should come as no surprise that Jesus would show his outrage at what things had come to there. For it appears this holy place had become, for some at least, a place of business transactions. Indeed, some believe that the surcharge for exchanging money into currency which was suitable for temple offerings was so exorbitant that the poor were not able to afford to encounter God in that place in the way that it was customary to do so. And that would have been entirely contrary to God's intent. Whatever the case may have been, clearly Jesus saw all of this as standing in the way of it being the holy place it was meant to be. And when Jesus comes face to face with it, he sees red. He throws the money changers and those selling sheep and cattle and doves for sacrifice into chaos. And so I wonder now. How is it that you and I can develop the eyes of Jesus? How do we gain sight or insight which is not content to turn away or to ignore or explain away that which gets in the way of others encountering the Holy One? How do I gain the courage or the will to see 'bright colors' which yes, sometimes will offend, even as they inspire? Surely one of the ways to do this is to invite others with 'fresh eyes' to tell us what they see and experience in the 'temple' where I serve. It may be those newest among us. Or those who have been away a while. Or children. Or simply someone who does not necessarily agree with me. While they may or may not actually have 'eyes of Jesus,' even in their questions and observations they are likely to challenge or point out what I have failed to see or no longer experience because I have grown accustomed to the 'way it is.' Oh yes, as we listen for the voice of Jesus in stories like we encounter now and in the experience of others? Maybe we start to see in new ways. For no, in fact, there is no way to know what barriers stand in the way if we fail to ask those who have experienced them. As one of those with a privileged place in the place that I live and serve, I am not likely to actually see or experience it myself. Now of course, even as I wonder this, I am aware that in this life our 'temples' may never be entirely clean. Even so, it seems to me that as we encounter Jesus' outrage today, the call is also ours to seek to see our lives, the lives of others, the 'temple,' and this whole wide world in which we live with the eyes of Jesus and to do what we can to rid it and us of all that would get in the way of others encountering God. Oh yes, sometimes it our call is to 'see red,' it seems to me. At least when it matters so. It's a funny thing. I posted the picture of 'the dress' above even before I was finished writing. As my words filled the page and I was scrolling further down, I found myself catching the image of the 'dress' out of the corner of my eye. And do you know that for the first time it actually appeared to be blue and black to me? I don't know what color 'the dress' actually is. But when I look at it from another angle? It does seem to change. So what then might it look like to see the world, our congregations, or our very lives from the angle or perspective of Jesus? What might it mean to look with fresh eyes at our sacred institutions --- especially our churches --- and to be a part of 'cleansing them' so that others might more fully encounter God? How do we get such 'fresh eyes?' Where might you turn to acquire the perspective necessary to see with the eyes of Jesus?